It started at 1 today and continues every day this week. I’m on the schedule to read at noon Wednesday (Pride and Prejudice, if you must know), and I’m going to try to hang around off and on and see what other people are doing. The place? Right in front of the library, on Central Boulevard between Magnolia and Rosalind. You’ll recognize us: We’ll be the people standing on the canopy above the front door. In celebration of National Library Week 2010 (April 11-17), 67 Books is a weeklong performance art event wherein 67 Orange County Library System (OCLS) cardholders read aloud for one hour at a time any book they choose from the OCLS collection, on the roof of Orlando Public Library. The number 67 corresponds to the number of hours Orlando Public Library is open in the span of one week. 67 Books is an independent production of Brian Feldman Projects in celebration of National Library Week. The event is supported through the in-kind donations of area businesses and individuals, and has not been paid for by the Orange County Library System. Still seeking project supporters and volunteers! Please contact projects@brianfeldman.com for information. LYNX (Central Florida Regional Transportation Authority): Take Inbound Link 3, 7, 11, 13, 18, 40, 51, 200, 204, 313. The bus stop is directly across from event site. LYMMO (Free Downtown Orlando Circulator): Exit bus at Magnolia Ave & Central Blvd, walk east on Central Blvd. | The closest city parking garage is Library Garage; see website for rates. Street parking is available throughout downtown, and free after 6pm Mon-Sat, all day on Sunday and city holidays. | Biking and walking are both good for you and pleasant modes of transportation anytime! If riding, please wear a helmet and flashing light (and reflective strip if you have one)! And don’t forget your bike lock! ORLANDO PUBLIC LIBRARY is the headquarters and resource center for the Orange County Library System. The 290,000 square foot downtown Orlando facility is one of the largest public library buildings in the state of Florida. The Library has been located at this site since its beginnings as the Albertson Public Library in 1923. Public Reference Departments in the Orlando Public Library include Children’s, Genealogy, Law, Library Central, and Reference Central. The Children’s Library offers spacious areas, special programs, computers and story rooms for our youngest readers and readers to be. A Computer Resource Center is located on the second floor and offers access to computers loaded with programs with word processing capabilities. The Friends of the Library Third Floor Bookstore is open daily and recycles withdrawn and donated books to the community. The Genealogy collection is one of the best in the Southeast and is a great place to begin research into family history. BRIAN FELDMAN PROJECTS is Central Florida’s premiere presenter of experimental time-based art since 2003. Dinners on stage with real life families, leaping off ladders for 24 hours, group tours in Google translated Swedish through IKEA, reading in public – this is what we do. Upcoming projects include 25 Movies Brian Feldman Has Seen At Enzian Theater (19-20 Apr 2010), The Adventures of Brian Feldman While Reading The Adventures of Tom Sawyer by Mark Twain on Tom Sawyer Island in Frontierland at the Magic Kingdom Park at Walt Disney World (21 Apr 2010) and Fringe of Nature (21-30 May 2010). 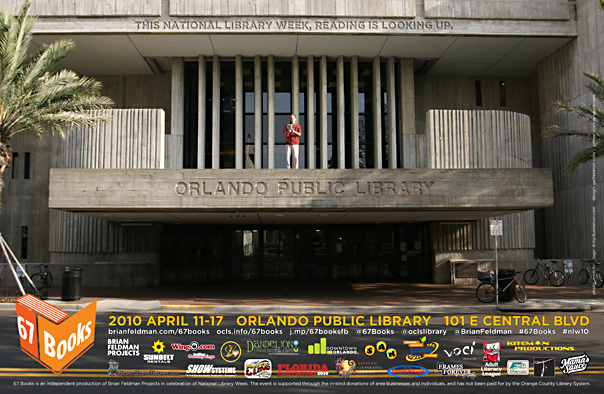 This entry was posted in Orlando theater, Other arts, Performance art and tagged brian feldman, national library week, orange county library system, orlando public library, pride and prejudice. Bookmark the permalink. Boy, that hour went by very quickly. I had a great time reading. Especially fun was trying to compete with the annoying electric taxis with music blaring or bikers stopped at the stoplight. But BEST was being able to read directly to people walking by on the other side or coming under the canopy. Some people answered me when the book asked questions. Yeah! Fun! My mother, the late Becky Nolan, started an after-school reading program for kids in Lake Helen. She and some other retirees, and sometimes actors from Shoestring Theatre, would read books aloud one-on-one or in groups. It was heart-warming how it piqued the kids’ interest in continuuing to read on their own!